I have received a lot of fresh herbs this year in my CSA box each week. Unfortunately, I haven't done the best job of using them up quickly enough so some have gone to waste. Here is a short article I found on how to best store fresh herbs for both short and long term use. Set a bushy herb like parsley, cilantro, chervil, or mint in a shallow glass of water and keep it on the counter or in the refrigerator for several days, just like a bouquet. Or, rinse it, wrap it loosely in a paper or dish towel while still damp, and place it (with or without a plastic bag covering) in the crisper or at the bottom of the fridge. Sturdy herbs such as rosemary or thyme can be stored in paper or loose plastic (either keep it loose or puncture some air holes to let out moisture). Or you can simply hang them upside down in the kitchen, where they will dry slowly. Do not manhandle delicate herbs like chives, tarragon or basil. Rinse lightly, wrap loosely in paper and place in a plastic bag in the crisper. Fresh herbs should last about a week if stored properly. If you're at the end of your garden's season and you have a tons of herbs left unused, you can most herbs to have later in the year. 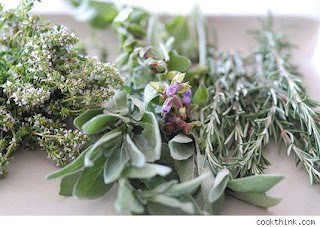 If you won't be using your herbs within a week or so, its best to freeze rather than drying. Frozen herbs will keep their flavor for several months. Unlike dried herbs, where the flavor gets more concentrated when drying, frozen herbs can be used in the same proportion as fresh herbs. Harvest the freshest, healthiest leaves. Spread the individual leaves on a small tray or cookie sheet. Freezing the leaves flat and individually will prevent them from freezing together into a brick. When frozen solid, place in airtight containers and return to the freezer. Once frozen individually, the leaves will not meld together. Stuff 2-3 individual leaves or a spoonful of chopped herbs in ice cube trays. Fill the tray half way with water. Make sure the leaves are down into the water, as best you can. They will tend to float, but we'll fix that with the next step. Place the half filled tray in the freezer. Once the ice cubes are pretty much frozen, finish filling the try with water. The leaves will no longer be able to float and should be completely surrounded with water. Now place the tray back into the freezer to freeze solid. Once the ice cubes are frozen, remove from the tray and store in zip closure bags. When ready to use, toss the whole ice cube into your favorite stew or dish. This is a very useful post! Although I add leftover herbs to my green smoothies, I often end up having to throw some, usually basil - my favorite herb - away. Thanks for the tips! I received basil from my CSA on Saturday and it was pathetic by Sunday... :( boohoo!